Is Optimum Nutrition Truly the “Gold Standard”? Optimum Nutrition Whey Protein, has been one of the most well-known names within the fitness industry in terms of protein powder, weight loss and a host of other supplements. 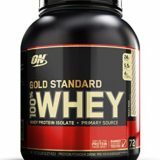 It can be argued that one of their most popular products is Gold Standard 100% Whey Protein. Offering no less than 24 grams of muscle-building and appetite-controlling power per serving, many consider this line to be one of the best in the business. Is this truly the case and can the ingredients stand up to our independent analysis? Let us take a closer look. Optimum Nutrition has to be given credit for the amount of flavours that users can enjoy. Some exotic options include cookies and cream, delicious strawberry, double-rich chocolate and even rocky road. These options are actually quite tasty and most will be happy with the variety. The ability to mix Optimum Nutrition 100% Whey Protein has always been a bit of an issue and while improvements have been made, clumping can and will occur if a glass is left standing for more than a few minutes. It is a bit of a shame that they have not yet been able to develop more of a colloidal option. Optimum Nutrition whey protein scores high points in terms of its texture. Some of us may even remember the days when we had to literally force the concoction down our throats. Although not as smooth as other brands such as NutriSport, some improvements have indeed been made. 5.5 grams of BCAAs, 4 grams of glutamine, a proprietary blend of protein (24 grams per serving) and only a single gram of sugar make this supplement one of the best in the business. We would still like to see appreciable amounts of vitamin A and vitamin C in the future. Our score: 85% out of 100%. 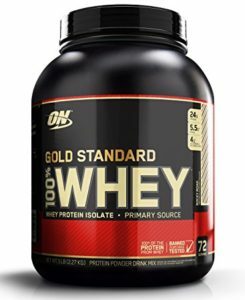 Optimum Nutrition 100% Whey Protein is currently priced at (approximately) £25 pounds for 27 servings. This is quite impressive when compared to its major competitors. The only trade-off is the fact that the levels of protein are slightly lower. We should still mention that 24 grams are sufficient for the majority of those who are searching for an effective meal supplement.